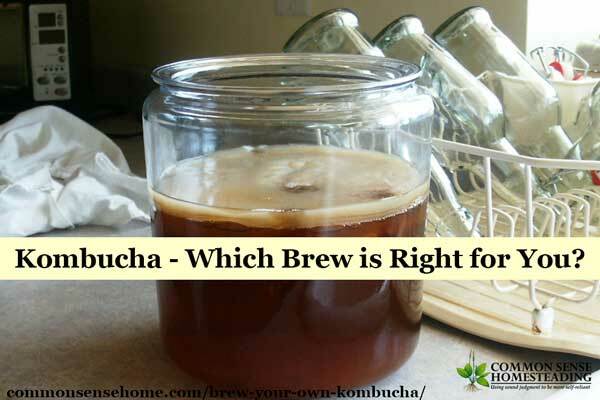 Brew Your Own Kombucha - Which Brew is Right for You? 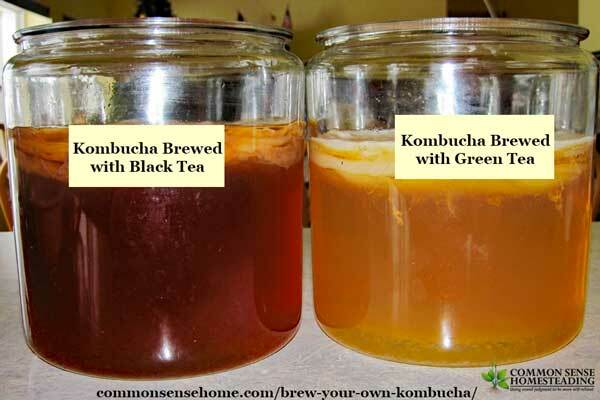 You are here: Home / Natural Health / Brew Your Own Kombucha – Which Brew is Right for You? 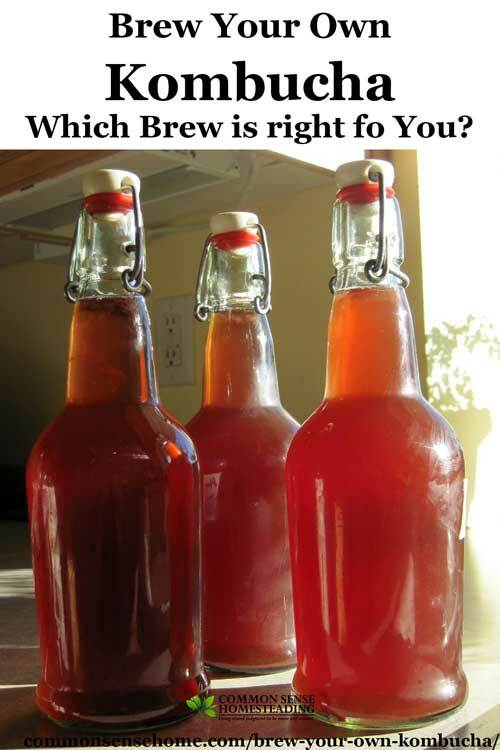 Brew Your Own Kombucha – Which Brew is Right for You? 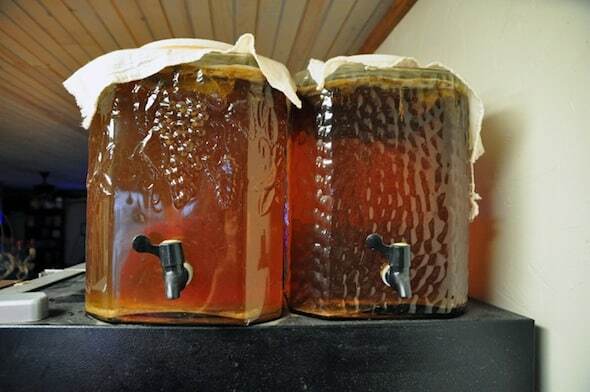 Kombucha sells for $3 – $4 (or more) commercially, but you can brew your own kombucha for just $1 -$2 per gallon. It's great for your digestion, and has helped more than one person kick the soda habit. It is carbonated, can be lightly sweetened if desired and lends itself to a variety of flavors. 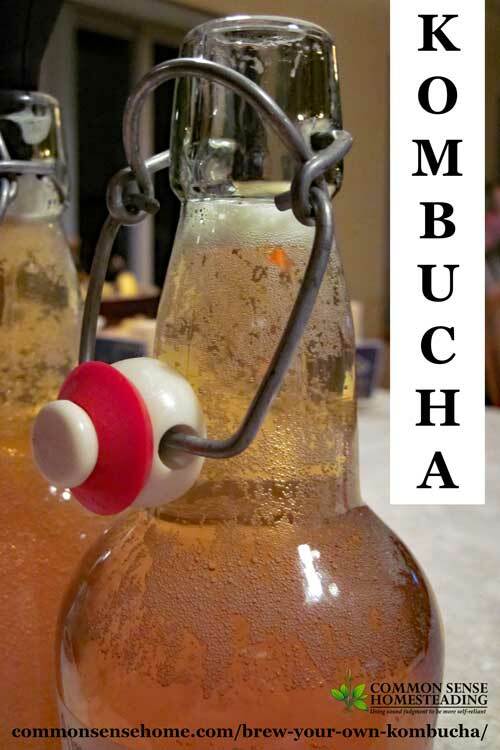 In this post I'll explain what kombucha is, how it tastes and how to make it. We'll also compare regular brewing versus continuous brewing. Just in case you've read this far but have no idea what I'm talking about. 🙂 Kombucha is a probiotic beverage made from sweetened tea. The culture using for brewing the kombucha is commonly referred to as a SCOBY, (Symbiotic Colony of Bacteria and Yeast). The kombucha culture is also known as a mushroom, mother, starter and various other names. The basic brew has been around a long time and been enjoyed by many people. As you can see in the photo below, the SCOBY is a weird, mushroom/pancake looking thing. A new scoby normally forms at the top of the container each time you brew. If you have a healthy culture and brew regularly, you will have baby scobys to share. Kombucha is always somewhat acidic (that's one of the ways that you know it's brewing – the tea changes from sweet to tart). The final flavor varies greatly with the age of the brew, the tea you start with, and whether or not you add additional flavorings. Leave your brew too long and it'll taste more like vinegar. I like to use loose leaf organic tea. The flavor is better, you know you're getting good quality and you're not paying for extra packaging. I keep one batch of Orange Pekoe (which is a black tea) and one batch of Almond Blossom Oolong tea going all the time now. Black tea kombucha has a stronger flavor and is the traditional choice for brewing kombucha. The oolong is more mellow and fruity without adding any fruit juice for flavoring. I often drink the almond Blossom Oolong “as is”, without additional flavorings, and add my flavors only to the black tea brew. Over the years I've come up with flavor blends from Pumpkin Spice to Pina Colada – the only limit is your imagination. Just don't brew your kombucha with flavored teas that contain oils, like Earl Grey. These can kill your SCOBY over time. Can Kombucha Bottles Explode (Like Wine Bottles)? While I have never had shattered glass, I have fired the contents of a bottle of kombucha from the kitchen to well across the dining room. I am pretty sure there are still some chunks of raspberries in one of the under cabinet light fixtures. In warm condition, carbonation can build up very quickly. Make sure to burp your bottles to let off excess gas, or keep them chilled to slow down gas production. Otherwise you may end up like the gentleman below, or worse. What Do I Need to Brew Kombucha? All you need is a starter culture, some tea, some sugar (the culture eats the sugar), clean water (no chlorine! ), a container (preferably glass) and something to cover the opening of the container (I use a flour sack towel and rubber band). In about 7-10 days, you'll have kombucha. With regular brewing, you set aside the scoby and some of your current batch to act as a starter for the next batch. If you use continuous brewing, you draw finished brew off the bottom and add fresh tea to the top. The post How to Make Kombucha includes step by step instructions for brewing kombucha at home. You can purchase a starter through Kombucha Kamp, as well as the rest of the supplies you need for brewing or continuous brewing. (Your Kombucha Kamp purchase helps support this site at no extra cost to you.) You can also google “buy kombucha SCOBY” or “free kombucha SCOBY” and your area to look for local places to buy or possibly get one for free in your area. Where Should I Brew Kombucha? Is Kombucha an Alcoholic Beverage? There is a very small amount of alcohol in kombucha – that's what yeast does to sugar. It should be less then 0.5%. If you add a lot of fruit juice and put it somewhere warm, you can probably drive this number up, but I've never had any batch get close to what I would consider “winey”. This is “booch”, not “hooch”. In a kombucha continuous brewing system, finished kombucha is drawn off and new tea is added to the existing brew. It can cost a little more up front, because you'll want to invest in a fermentation vessel with a spigot to draw off the finished kombucha. Less maintenance. The brewing container only needs to be cleaned once in a while, instead of with every batch. Better odds of successful brewing. Less handling of the scoby and containers means lower risks for introducing stray microbes. Minimal SCOBY disturbance. Just like avoiding tilling protects soil life, keeping the scoby fed and happy let's the beneficial microbes thrive. Continuous brewing provides short and long brew kombucha benefits in one container. Shorter fermentation time yields kombucha with a milder flavor, but longer fermentation yields more probiotics. Continuous fermenting maintains a mellow flavor AND more probiotics. Water Kefir Versus Kombucha – What’s the difference between water kefir and kombucha? Both are probiotic beverages you can brew at home, but which one is best for you? How to Make Coffee Kombucha – use extra SCOBYs to transform coffee into a probiotic beverage. Great for making iced coffee (don't heat it up, or you'll kill the beneficial bacteria). 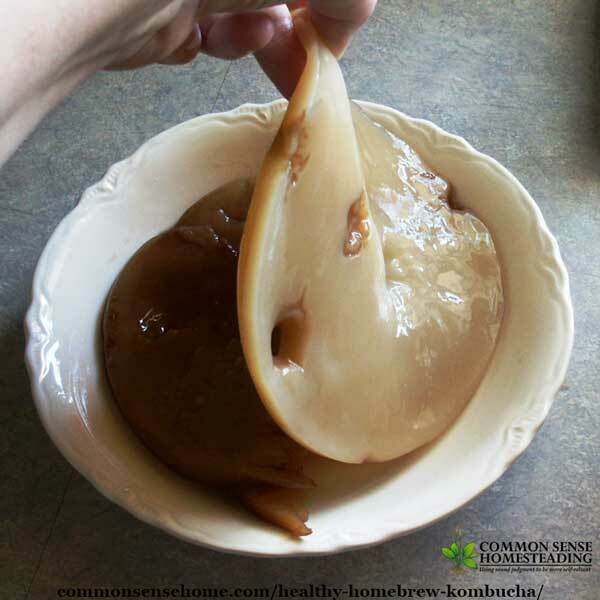 The SCOBY Cure – Home Remedy for Cradle Cap – how I used a kombucha SCOBY to cure my son's cradle cap. H, i am interested in trying kombucha but where can i get the starter i am from Malta/ Thanks. You can purchase a starter through Cultures for Health (one of our affiliates), or google “buy kombucha SCOBY” or “free kombucha SCOBY” and your area to look for local places to buy or possibly get one for free in your area. There is also a Kombucha SCOBY Exchange page on Facebook. Sounds great and I’d love to try it! But I don’t have a starter or any access to it. How can you start it yourself?? Now all I have to do is find ready made Kombucha tea in a shop. I live in the Netherlands, so that could be quite a search. Failing that, I’ll see if I can find someone in the Netherlands on Facebook to send me one. I have blown the bottom of out a couple of Grolsch bottles of KT in the summer when the temps in the house were over 75 during a second ferment, before being moved to the fridge. It’s rare, but it does happen. Thanks, KerryAnn, good to know. A good suggestion to prevent a hazardous situation and minimize mess in the case of an exploding bottle is to place your bottled brew into a room temperature cooler until it’s ready to go into the fridge. Hi! I have gerd and I was able to try kombucha in the U.S I’m from the Philippines and I would like to know if there’s a way I can brew my own. Our country is very warm. Thank you! 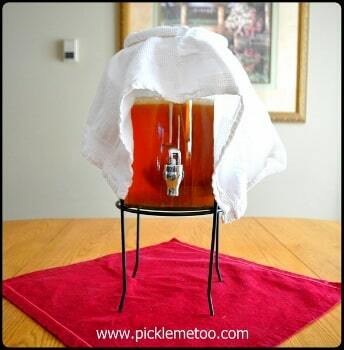 If you can find a scoby, you should be able to brew, it will just be ready to drink very quickly. I’m not sure what regulations apply, if any, for shipping live cultures to the Philippines, and how they would safely be handled during transport to keep them alive in the heat. I’ve heard of people traveling abroad carrying a strip of scoby in a water bottle with sweet tea to feed it. Always check with your doctor to make sure supplements won’t interact with any medication that you may be on of condition that you may have, and start slowly when adding kombucha to your diet.